Posh man of the match Jon Taylor celebrates his hat-trick goal against Blackpool. Photo: Joe Dent/theposh.com. 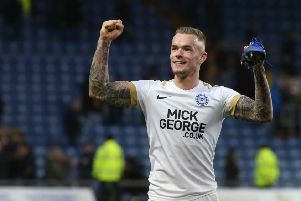 Peterborough United substitute Jon Taylor was everyone’s man-of-the-match after firing a 12-minute hat-trick against Blackpool at the ABAX Stadium today (May 7). Posh star Marcus Maddison scores from the penalty spot against Blackpool. Photo: Joe Dent/theposh.com.